Does anybody know how they do it so seemingly well. Those pictures on there site. They do real teenage hairlines, and they pack it 70-120 grafts/ cm squared they say. Where do they get all the donor hair? Is this a quick fix transplant that will fail in a few years? » transplant that will fail in a few years? Bucket, Dr. Armani has been creating wonderful hairlines for many many years now. There is more to just implanting grafts. The surgeon needs to have mastered high density implanting, hairline design, temple angle closer - preserving the male angle just to name a few - all skills needed to create a beautiful hairline and result. Dr. Armani listens to what the patient wants and then artistically redesigns the hairline to its NATURAL placement, based on facial features and ethnic background. Before any surgery takes place Dr. Armani examines the scalp for future miniturization as well as the donor availability to develope a plan for that particular patient. Take a look at my case below. 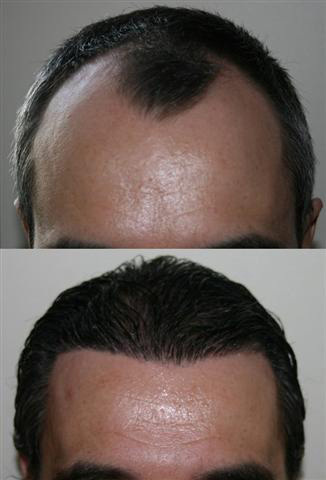 With 6,000 grafts Dr. Armani was able to rebuild my hairline, the top and fill in the crown with 2,400 grafts. I still have another 3,000 - 4,000 grafts atleast to address any future thinning that I may have. My hairline was rebuilt yes, but also my top and crown, with plenty of grafts left in my donor by Dr. Armani to address any future thinning. You probably know the answers to my reply, but you have asked the questions. So just in case you are just beginning your research in to getting a transplant Ill answer some of your questions. Donor hair comes from the back and sides of your head, depending on the texture, quantity needed and how many hairs etc. Its taken from these areas because most people generally dont lose hair from this region, so will take on the same characteristics in the new area it is placed. Of course your existing hair in balding zones has a possibilty of falling out as time passes. So thats one of the things you need to determine before under going a procedure. Many people including myself stablise the loss of hair, some even reverse the process with medications such as finesteride and minoxidl to name a couple. Some also get side effects which is also something you need to consider as once you stop taking such meds the hair you maintained that would of fallen out should fall out. Anyway you probably know all this. I hope Ive helped. Pay close attention to whether the pics you’re looking at are the results of strip HTs or FUE. Armani was a strip HT doc for a long time and a lot of their best pics are of that work. Armani was a notoriously great strip HT doctor by anyone’s reckoning. But there is less agreement about the results now that his clinic has gone to FUE-only work in the last couple years. I’m not saying the work is BAD. I’m saying the jury is still out, and the evidence is not as positive as his strip work generally was at this stage of grow-out. I think the best thing that might be said eventually is that Armani’s FUE work takes longer to grow out. At worst, it turns out to have graft survival rates nowhere near his strip work. As for the donor hair/short term issues, their clinic has insisted that they can pull as much as 15,000 donor grafts with FUE-only work. That’s almost twice what the rest of the FUE clinics find to be very feasible, and nothing of the sort has been proven despite repeated requests. Interpret this any way you like. Overall I do not find Armani’s clinic to be a BAD place to get worked on. It’s still one of the dozen top HT clinics in the world in the big picture. But I do not think their work supports many of their claims. It looks to me like their FUE work is about as good as most of the other top HT clinics, not over-and-above the others. To answer your first question, if there are any poor Armani results out there… We take great pride when it comes to our patients happiness level. Where we do have a very high success rate no clinic can guarantee 100%, occassionaly a patient may require a small touchup to meet their original goal. Although this is rare, it does happen. A touch up when needed is done free of charge. Cal, if you are interested in speaking with a patient who required a touch up please email me, I would be happy to put you in touch with one. As far as the work seen being strip or Fue?? I will start off by explaining that all of the results on Dr. Armani’s website clearly state if the work was done by Strip or FUE. I also make it very clear when posting pictures. Further I would like to say that Armani FUE is growing out very well. I have posted some results below. Armani is still creating the jaw dropping hairlines that he alwasy has, only the technique has changed. 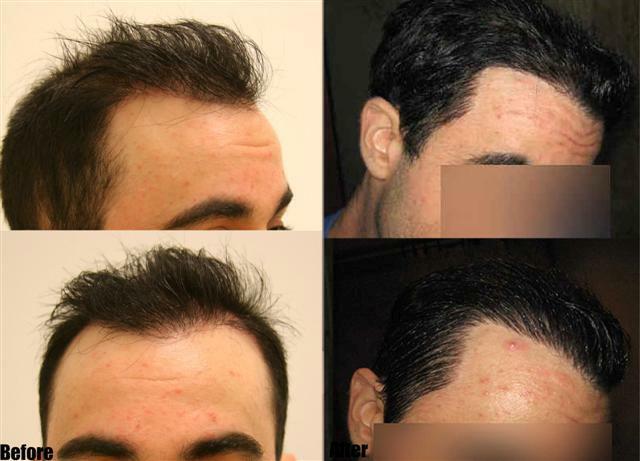 Below are a few hairlines that were created with FUE alone. I was wondering the same regarding Armani FUE results - they do not seem quite as impressive as his earlier strip work. Either the yield is low, or they take longer to grow out as it seems to me. Many of the FUE posters on this board are still seeing very minimal growth at 5 and 6 months, where the strip work seems to be starting to grow strong at 3. Is this a common difference between strip and FUE, or is it unique to Armani? Im saying, so all FUE procedures take longer to grow out?, or not? Could this be because most FUE docs do the extraction and implanting themselves and armani has a large team which does it? From my understanding Armani has like 10+ techs which do ALL extractions and implantations and Armani only punches the implant holes. Seems to me Armani’s yield might be low because of this… unless of course FUE just takes longer to grow out. Which is it??? I don’t understand this statment. All of the patients I have been seeing in person, not to mention the guys posting their pictures up on the forums seem to be yielding just fine. Who are the guys that are having low yield? The fact is, people grow at different rates rather it be strip or fue. Take a look at the patients below, all of them looked pretty good at the 5 to 6 month range from FUE, and the end result looked even better!! In the end, final results should be judged at the 14-18 month mark, and I would say those final results are looking pretty good! I have seen many of Armani’s FUE results grown out and they all look very nice and very natural.From what I had seen in person and on the forums, FUE is growing out just as good if not better then Strip Procedures. The quote you didn’t understand was referring to Armani’s possible yield. IF Dr. Armani’s yield is low I was questioning whether it is due to his 10+ techs doing the extraction and implantation of every FUE graft as opposed to other top clinics where the doctor does all extraction and implantation. I do not know the experience level of Armani’s techs. Does the same crew travel the world with him, or does he have seasonal techs in Cali, Canada, Dubai, etc. I say IF, and a big IF, because I was wondering whether FUE results simply take longer to grow out in general as opposed to Strip, or if Armani’s FUEs have a low yield particularly. In this case I cant tell the difference between his before and 5 months post op pics??? I’m sure a few hairs have sprouted, but this guy had 4100+ FUE grafts implanted!! Where are they? These are your FUE results pats. The first HT, the Strip one, looks great! Love the results, I loved them at 3 months too. Your FUE at the crown is coming in better than the one above, but it’s still very weak at 5.5 months as opposed to your strip procedure. Im just wondering why the difference? And why aren’t sds1977’s 4100+ grafts strouting? 5 months should begin showing results, I dont see anything closely resembling the 10,000 or so hairs which were transplanted. » seem to be yielding just fine. Who are the guys that are having low yield? » The fact is, people grow at different rates rather it be strip or fue. 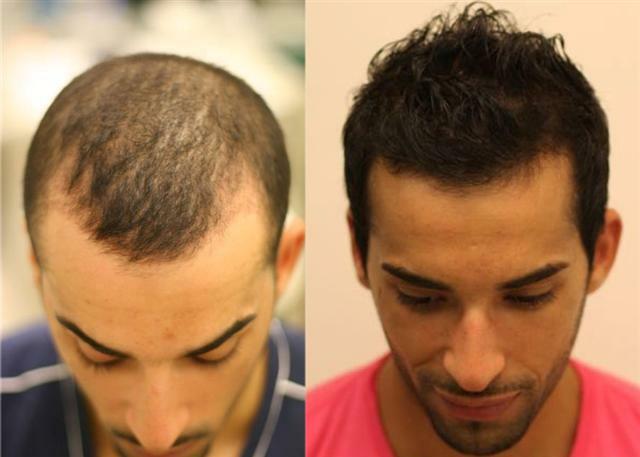 » to 6 month range from FUE, and the end result looked even better!! » would say those final results are looking pretty good! » FUE grafts implanted!! Where are they? » hairs which were transplanted. I think the problem is near this because i am sure i read somewhere here about sds1977 the amount of hairs he got for 4100 grafts and think it was about 7000. it seemed low when i saw it but could explain the results, maybe not growth maybe just low amiunt of hair for the number of grafts. still a big problem. Maybe he did get a large number of 1-hair grafts, I don’t remember reading that, but if it’s the case I have another question: Do Armani’s techs remove whatever grafts they feel like, or do they get X number of 1’s for the hairline and Y 2’s and Z 3’s for behind it? I have never heard the answer to this question, so maybe Pats could chime in here. If they are supposed to isolate and remove 2’s and 3’s, why not in this case? But most importantly, as you say in your previous post, This is a big problem that SDS’s grafts are not growing at 5 months - looks like a poor result to me… hopefully not for 4100+ grafts!! Does Dr. Armani stand in the room and supervise his techs? Or does he just punch the implant sites in 45 minutes and leave the techs alone for the other 10 hours? The yield issue is a matter of skill for the techs and has nothing to do with Dr. Armani if he is not doing the extractions. This could very well account for any POSSIBLE disparity in yield between FUE and STRIP. I say POSSIBLE because I still haven’t heard from anyone if FUE takes longer to grow out in general than strip, because these FUE results are not encouraging at 5-6 months, which is very unlike Armani’s strip. » maybe not growth maybe just low amiunt of hair for the number of grafts. » still a big problem. Dr. Umar is the ONLY surgeon that I know of that does his own implanting. That is why his even-modest procedures take many days to complete. What other FUE surgeons do you think do their own implanting?? If you are confused and were referring to the creation of the recipient sites, then I don’t know of a surgeon who does not create their own recipient sites. Dr. Armani creates his own recipient sites. As far as FUE results go, it just don’t get any better than the patient called Golfjunkie. You will not find many more-natural results than this - FUE or strip. By the way, I had four(4) technicians work on my procedure at AlviArmani which is less than the number of technicians that worked on my procedures at Bosley years ago. Sure, Dr. Cole has 2 techs which only do sorting of grafts and instruments. Dr. Bisanga does all his own as well. Thought woods did too. Anyway, this team of 10+ techs is very large, and my real question is regards to yield, and why sds1977 is not seeing any, or other recent patients. » “The quote you didn’t understand was referring to Armani’s possible yield. » recipient sites. Dr. Armani creates his own recipient sites. » supposed to isolate and remove 2’s and 3’s, why not in this case? » result to me… hopefully not for 4100+ grafts!! » are not encouraging at 5-6 months, which is very unlike Armani’s strip. » » still a big problem. those numbers don’t seem to add up to what other docs do, seems to be a hell of a lot of singles and doubles compared to the amount of grafts. I don’t know anything about a “team of 10+ techs”. Where did you get this number. I had four (4) techs work on my procedure with AlviArmani. I was unaware that Dr. Cole’s techs don’t implant. That is the complete opposite of what some of his former techs have posted on this forum and I would be very surprised if he does any of his own implanting. I love armani’s hairline design, but it’s no good if the FUE grafts aren’t growing out. I do hope I’m wrong and they are, but the two blogs I linked to before aren’t showing great results at 5 - 6 months when a lot should be happening - especially sds1977’s results, I dont see any! » number. I had four (4) techs work on my procedure with AlviArmani. » and I would be very surprised if he does any of his own implanting. The HT industry as a whole has embraced techs doing major portions of the work at every stage. I don’t know a whole lot about who uses how many techs for what, but in general I don’t think the Armani clinic’s tech usage is known for being anything abnormal in the industry. Whatever concerns a person might have about the Armani clinic’s FUE growth, I would just wait it out another 6 months. The clinic has done a lot of internet-visible FUE patients that are in mid-grow-out right now. If the growth turns out to be subbpar, there will probably be too many patients for the clinic to hide it any longer by this winter. » The quote you didn’t understand was referring to Armani’s possible yield. » to other top clinics where the doctor does all extraction and implantation. » These are your FUE results pats. The first HT, the Strip one, looks great! » as opposed to your strip procedure. Im just wondering why the difference? Give the results some time to grow my friend… the patient just hit 5 months. At this stage some people have lots of growth, some are just starting to sprout… Check out the patient below, he seemed to be a bit of a slow grower, then took right off from months 6 to 9, and still has more growth to come. People grow at different rates rather it be strip or Fue. Thanks for the answers, Pats. Sounds like you’re with a good clinic. Could you help me out with just a couple more Armani questions? About the techs, do they travel with Dr. Armani, or does he have different techs for each of his clinics which work when he is there? What is the average yield for Armani’s FUE? How about his range? Do FUE results take longer to grow in generally, or is it the same as strip? Is Armani’s yield for FUE the same as his yield was for strip? Lastly, are you aware of any poor FUE results from Dr. Armani? If so, how many and how poor?